Our online registration process has been created to allow parents/guardians to register their students at their own convenience and is designed to retain all of your student/family information to save you time for future registrations. If you do not have access to a computer, please contact your child's home residence school for assistance. Once you have completed the registration process one year, the majority of the information you have added will be visible each year. Make sure you change dates to match the date you are approving specific permissions, questions, or data fields. Make sure you use your Portal account to access the online registration. If you do not have a Portal account or have forgotten your password, call Mary Boge at 563-744-3885 ext. 6030 or send her an email requesting your password at mary.boge@wdbqschools.org. 2. Click the Portal button that is located under the slideshow banner. 3. Enter your Username and Password. Click Sign In. 4. In the lower left corner, click Online Registration. 5. If the Returning Families and New Families window appears, choose Returning Families if YOU HAVE EVER HAD A STUDENT WHO ATTENDED OUR DISTRICT. Choose the New Families option ONLY IF YOU HAVE NEVER HAD A STUDENT ATTEND OUR DISTRICT. 6. Make sure the names of the students residing at your address are included in the green window that appears. If there are students listed who no longer live at your residence, please contact Mary Boge before continuing with the registration process (563-744-3885 ext. 6030 or mary.boge@wdbqschools.org). Any student listed in your account for whom you are not the Primary Care Provider, will appear as a no in the Included in new App? column. Contact Mary if this information is not accurate. You cannot register a student for whom you are not the Primary Care Provider. If all information is accurate, click Begin Registration. 7. Continue with the registration process. To ensure that your information is being saved as you move from pleat to pleat (sections), click the Save/Continue button at the bottom of each tab. ONLY PARENT/GUARDIANS REGISTER STUDENTS USING A PARENT PORTAL ACCOUNT. NEVER USE A STUDENT PORTAL ACCOUNT TO TRY TO REGISTER. 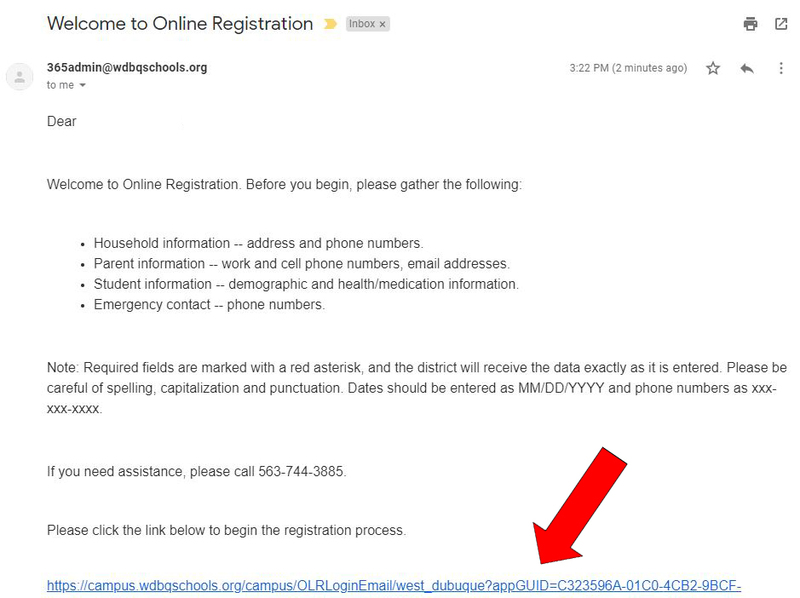 NOTE: You will need a valid email address in order to complete the online registration process. If you do not have an email address, here are instructions that show you how to create an active Gmail account. When you open that email message, read the message and then click on the link at the bottom of the message. This link is unique to your NEW student registration. Do not share it. Continue using this link to access your NEW student registration until you have Submitted your registration. Once you have submitted your registration, you are now an Existing Family and will use that button or option in the future. Complete the information you will now see for the rest of the registration process. Make sure you are clicking the SAVE button or link at the bottom of each page even if you have not completed the page. This saves the information you have added so you do not need to start over and you will be able to resume your registration in close to the same place you left off. If you are interested in a tour, call and schedule an appointment with your home residence school. Shared Visions is a FREE 4-day program (Mon.-Thurs.) located at Epworth Elementary. Enrollment is limited to 16 children and is based on family income (guidelines are set by the State of Iowa). Children must be 3 or 4 years of age on or before September 15. We offer a FREE 3-day Preschool program (Mon.-Wed.). We also offer a 4-day Preschool program (Mon.-Thurs.) for a minimal tuition fee for the fourth day. Children must be 4 years of age on or before September 15. Our Kindergarten program is all day, every day. Children must be 5 years of age, or older, on or before September 15. Please contact the school principal.